No matter if you’re looking for a gift for your baby, your grandson or your friend’s child, choosing the best one may be quiet difficult. If you have been to a shop with baby products or tried to find something in online store, you probably already know that the choice is vast. There are plenty of different toys, cute clothes and accessories (that are rather for parents than babies). Some of them are really popular or advertised in television, however it doesn’t mean they are the best or that you should choose them. 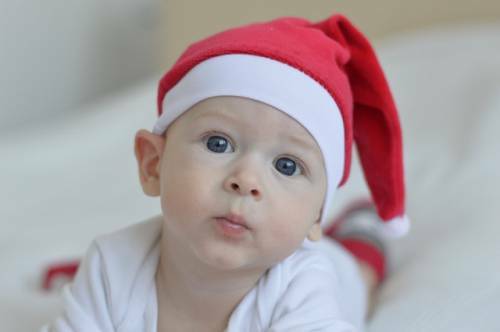 I prepared this buying guide and list of Christmas gift ideas for babies to show you how to find proper gift for children at different ages. Something that will be useful and will serve the baby for longer time. In my list of gift ideas you will find mostly education toys – simple toys and books that help babies learn new vocabulary and social skills, moreover they arouse babies’ curiosity about the World and stimulate their imagination and creativity. This kind of toys is great for child’s proper development and provide excellent fun. Generally speaking, baby’s mind is like a sponge, it easily absorbs new information. Moreover, babies are very curious about the World, love to learn and they learn pretty easily. However, remember that too many stimuli can quickly tire the baby. It’s not only tiring, but also distracting. That’s why baby should have only few toys to play with at one time. The rest of toy should be hidden – for the next playtime. Black and white toys – they stimulate baby’s vision and the whole brain. Besides, infants love them. Educational mats – they take care about the comprehensive development of baby’s senses and provide perfect space for exercises for muscles. Toys with many different parts that make different sounds (rattle, squeak, rustle etc) – Infants use them as soothers or teethers. This kind of toys is useful for comforting the baby. Book made of colorful soft fabrics – it’s never too early to start reading to babies and teach them first words. Baby can practice motor skills when flipping the soft pages and colorful pictures stimulate his vision. Toys with mirror – infants usually love to play with the mirror, long before they realize it’s their reflection. This type of toys is helpful for developing self-recognition and self-awareness. Between 1 and 2 year of life children practice their new ability – walking. They also love to insert and remove items from a box or container and they usually like to listen to melodies and different sounds. Wooden musical toys – they are great for developing sense of rhythm, eye-hand coordination, concentration and manual skills. Wooden cars – this type of educational toys are useful for developing imagination, spatial awareness and sense of direction and distance. Blocks – they are not only great for creativity and imagination development, but also stimulate manual skills, eye-hand coordination and motor skills. Colorful blocks with letters and numbers may be useful for teaching baby name of colors, first letters and numbers. Pull toys and walkers – they encourage baby to practice walking and develop motor coordination. Puzzle – of course for such a small child, you need to pick something simple. But this type of toys can be excellent to develop motor skills and start practicing logical thinking. Between 2 and 3 year of life, the speech and language development is very important. That’s why parents should often read to their babies. Another important thing is to practice fine motor skills (palm and fingers development). Books with stories and tales – thanks to them baby can learn new words and they stimulate his imagination. Wooden stack-up blocks – When baby can built a tower with colorful blocks, it develops his creativity, spatial awareness, manual skills and visual-motor coordination. This toy can be also useful for teaching color recognition and teaching math. Wooden alphabet – for teaching letters and words. Board with geometric figures – excellent way to practice math skills, teach logical thinking. This toy also support development of fine motor skills. Watch with removable elements – this board with removable blocks with numbers can be very helpful for teaching baby how to tell time and match the shapes.